Note: Japan's Kashiwazaki-Kariwa nuclear facility has not operated since being shut down in 2011 and has not submitted a restart application. An estimated 62,500 power plants are operating around the world, with a total installed generating capacity of more than 6,000 gigawatts (GW) in 2015. The nine largest operating power plants in the world by capacity are all hydroelectric power plants. Four of the world’s ten largest power plants are located in China, and all four of those plants began operating in the past 13 years. The world’s largest dam, Three Gorges, is located on the Yangtze River and has a capacity of 22.5 GW. Hydroelectric power is the second-largest source of electricity in China, after coal, and accounted for 20% of the country’s total generation in 2015. 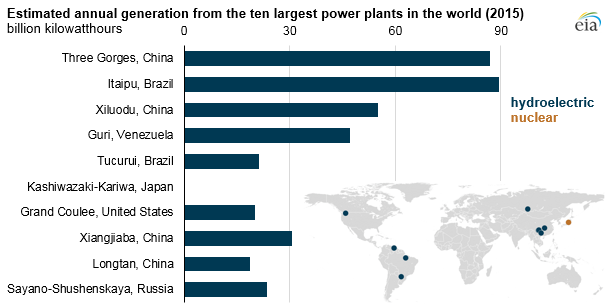 South America is home to three of the world’s largest power plants. Brazil’s Itaipu Dam, located on the Parana River that forms the border between Brazil and Paraguay, has a capacity of 14 GW. Although the Itaipu Dam is the second-largest power plant in terms of capacity, it ranked first in the world in generation, producing 89.5 billion kilowatthours (kWh) in 2015, compared to Three Gorges’s output of 87 billion kWh. Differences in seasonal flows of the Yangtze and Parana rivers account for differences in the output of the Three Gorges and Itaipu Dams, respectively. The Kashiwazaki-Kariwa nuclear power plant in Japan is the largest nuclear plant in the world and the sixth-largest power plant of any type in the world. However, Kashiwazaki-Kariwa is among the many nuclear plants in Japan that were shut down in the aftermath of the accident at Fukushima in 2011 and has yet to file for a restart application. The Grand Coulee Dam is the seventh-largest power plant in the world and the largest dam in the United States. It supplies power to eleven states (Washington, Oregon, Idaho, Montana, California, Wyoming, Colorado, New Mexico, Nevada, Utah, and Arizona), as well as Canada. Grand Coulee Dam was the largest power plant in the world from 1949 through 1960, when power plants in Russia and Canada surpassed Grand Coulee. After an expansion, Grand Coulee was again the largest in the world from 1979 through 1986, when it was supplanted by Venezuela’s Guri Dam. The Sayano-Shushenskaya Dam in Russia is the tenth-largest power plant in the world. Located on the Yenisei River, it is the largest power plant in Russia, with a capacity of 6.4 GW. Hydroelectric power accounts for 21% of Russia’s electricity generation. The capacity of large hydroelectric plants is generally based on the capacity and the number of turbines installed, rather than on the volume of water in the reservoir behind the dam. For instance, the Three Gorges Dam could, at the maximum level possible, hold about 10 trillion gallons of water. Dams with lower electric generation capacities, such as Venezuela’s Guri and Brazil’s Tucurui dams, can hold more water, with maximums of 36 trillion and 12 trillion gallons, respectively. A trillion gallons weighs about 4.2 billion tons and occupies the volume of a cube that is almost one mile (or 1.56 kilometers) wide. Several countries are building large power plants to meet growing electricity demand. 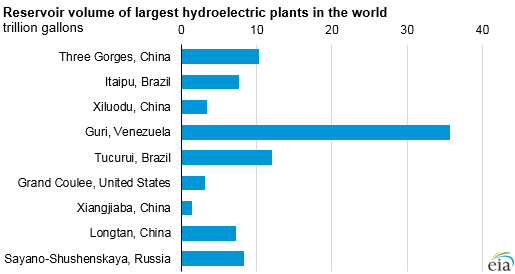 Some of the soon-to-be-largest power plants in the world are hydroelectric plants under construction in countries such as China and Brazil.